Oxygenetix foundation and moisturizer act as a virtual second skin, allowing it to breathe with no occlusive oils to interfere with the body's natural healing process. Oxygenetix Oxygenating Moisturizer soothes, protects and repairs even the most sensitive skin. It aids in tissue reconstruction, systematically builds collagen layers and reinforces natural skin healing. 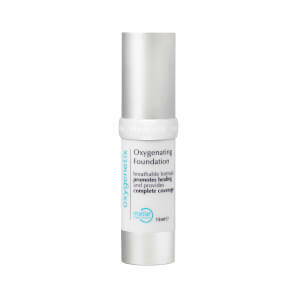 Just one example of Oxygenetics line of foundations that heal the skin while providing coverage is Oxygenetix Foundation - Beige. This patent-pending formula increases oxygen levels to the skin as it promotes cell production and healing. It is also suitable for sensitive skin types - including rosacea, acne, eczema and psoriasis. Designed for doctors, Oxygenetix products cover and treat a wide variety of skin problems: skin injuries, wounds, rashes, cracked dry skin, scars, rosacea and other skin conditions. On post surgical scars, patients are reassured and impressed that after care includes safely camouflaging any evidence of surgery.